Nikon's Monarch 3 Binoculars: Are They a Secret? Nikon's Monarch 3 Binocular — Is it a Secret? We took our new Nikon Monarch 3 binocular with us on a walk after receiving it — sort of a get-acquainted excursion if you will. We'd learned about it while visiting with the Nikon people at the 2012 Shot Show and ordered it soon afterward since we were anxious to see how it performed. 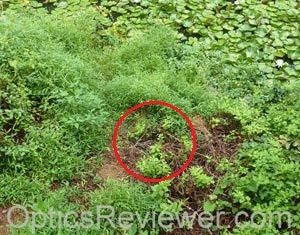 As we went along, we found ourselves at water's edge and, looking down, noticed what appeared to be a number of small dead tree branches along with dried brambles. As we surveyed our surroundings, however, we noticed that one of branches seemed a bit unusual. 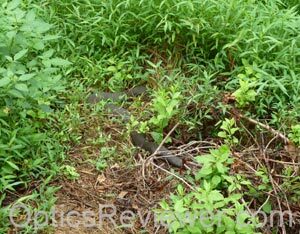 Using our new Monarch 3 to get a better view of it, we realized we were in the company of a mature Northern Water Snake (nerodia sipedon) which seemed to have been enjoying a healthy diet. While we didn't want to intrude on what might be an after-dinner nap for him, we estimated our friend might be close to the 4.4ft (135cm) length these snakes often achieve at maturity. 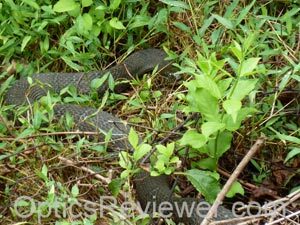 According to some sources, the northern water snakes are among the most common water snakes to be found in North America, so our noticing it was simply a pleasant interaction with a fellow creature rather than a rare find. As do many snakes, they present coloration variety from one locale to another, but we understand that these typically darken with age. Interestingly, they're a bit more reserved than other snakes and more likely to bite when they feel threatened, although they're not venomous. If you've handled a northern water snake, you'll no doubt remember that one of their defense mechanisms is to release a memorable, musk-type odor when alarmed. They're valuable to us, however, because they not only feed on diseased and dying fish, they also help to prevent fish overpopulation which can stunt fish growth. Leaving our silent, resting friend in comfort, we pressed on with our new binoculars. For those who may be wondering about the difference of the Monarch 3 to the older Monarch III, as far as we have determined the Monarch III was essentially the Monarch II with dielectric prism coatings. The Monarch 3 has silver alloy prism coatings, is fully multicoated and was introduced by Nikon during September 2011. Strangely enough, we've not seen much discussion of them yet. Let's press on with this review and we'll tell you what we found…. 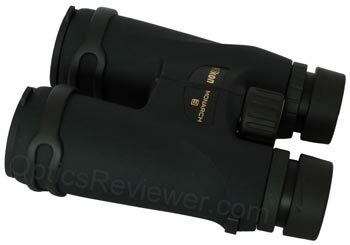 The binocular we bought for this review was the 10X42 configuration. It's a configuration that's increasingly popular for use on the plains and in mountainous areas, as well as in marshes and other areas with an extended, unobstructed view. We feel the 8X42 is a better configuration for shorter viewing distances such as those found in wooded areas. There are two reasons for this: 1) the higher magnification is not necessary for the shorter distances encountered in those settings, and more importantly 2) the lower magnification typically provides for a wider field of view that's particularly useful for seeing what's happening in a wooded setting. Yes, a 10X will work in the woods — we just prefer the ability to see and quickly focus in on activity that we would likely miss otherwise. While it isn't what waterproofs them, the Nikon Monarch 3 ATB binoculars are fully armored with a textured rubber to provide a good grip in either wet or dry conditions. Does it contribute to the binocular's durability? We believe it gives a small amount of cushioning against bumps, but perhaps just as important is the protection it provides against those unintentional pinches and scrapes that deface the hard surfaces under the armor layer. Something that we routinely use and miss if a binocular doesn't have it is the fitting for a tripod adapter. This is usually located on the front (toward the objective lenses) of the hinge and typically has a plastic "button" with the manufacturer's logon on the front with a threaded stub on the back. The threaded stub is simply turned into the fitting and nicely conceals it from view. The Monarch 3 includes this feature so it can be used on a tripod for observing even more details than would otherwise be possible. 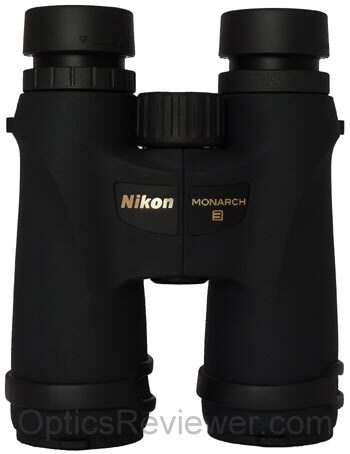 Our contact at Nikon tells us that the Monarch 3 binoculars achieve their light weight largely through using polycarbonate reinforced with fiberglass for its chassis. It appears to be a good combination for reducing weight while maintaining structural strength. The various components used to make the Nikon Monarch 3 binocular which we bought and used for these tests appeared to be well fitted together and worked smoothly with each other. It is well balanced and easy to use — we did not have the feeling that it was tiresome to use for extended periods of time. We can't think of any recently produced Nikon roof prism binoculars that are NOT waterproof and fog-proof. That's not to say there aren't any, only that there aren't any that we can easily bring to mind presently! Having said that, the Monarch 3 binoculars are both waterproof and are filled with nitrogen gas to eliminate the internal fogging that can ruin what would otherwise be a terrific outdoor experience. We are delighted with the quality of the twist-up&sol;twist-down eyecups on our Monarch 3 binocular. There's no mistaking when you extend them and there's little chance of them slipping back down when you put the binocular up to your face as we've experienced with some other binoculars — even some more expensive ones. We felt they were comfortable to use, too. The eyecups have two intermediate positions to adjust for varying eye relief needs. As with when the eyecups are fully extended, we didn't have any problems with them slipping out of an intermediate position adjustment. For those who've not experienced the frustration of having eyecups "self-adjust" when you're having an intense viewing moment, we'll just say it's not pleasant and leave it at that. Our Monarch 3 eyecups were great during all our testing. The two intermediate positions for the eyecups are significant when considering the Monarch 3 binoculars have a longer eye relief than many others. Our 10X42 gave us a very generous eye relief of 17.4mm which seems likely to satisfy many eyeglass wearers' needs. The 8X42 provides even more at 24.1mm, which should accommodate eyeglass prescriptions for nearly all vision corrections. The focus wheel is silky smooth and a joy to use in focusing our Monarch 3 binocular. Some folks become accustomed over a number of years to turning the focus wheel in one direction to go from close focus to infinity, but binocular focus wheels aren't uniform in that regard. Since it can sometimes be easier to change binoculars than habits, we'll mention that the Monarch 3 focus wheel turns clockwise to go from close focus to infinity. Our regular readers may have been waiting to see how long it would take for us to get around to talking about whether the Nikon Monarch 3 binoculars have a "slow focus" or a "fast focus." We define a fast focus as a design that takes us from close focus to infinity in a single revolution of the focus wheel. Anything less than a single revolution is faster than most people can make good use of and it makes achieving a fine focus difficult. A slow focus, then is a design that takes the user from close focus to infinity in significantly more than a single revolution of the focus wheel. Nikon has achieved a good focus mechanism design with the Monarch 3 — it takes just under 1.25 revolutions of the focus wheel to go from close focus to infinity. On a personal level, we're happy with Nikon's design in this regard and we think you will be, too. Where are the Monarch 3 Binoculars Made? We find folks are often interested in where a given binocular is made. Often, it seems that this is based on a perception that its level of quality can be assessed based on a knowledge of where they were manufactured. Sometimes, concern is expressed that optical instruments made in one country or another are not up to the quality of those made in another country. We find that the quality is largely dependent on what is accepted by those who contract with the optical manufacturer. Our Nikon Monarch 3 binocular has "Made in China" stamped in the rubber armoring next to the serial number. Based on working with our binocular, we believe that the Monarch 3 is Nikon's design and that Nikon stipulates quality standards which provide Nikon optics at very competitive pricing. We don't always mention it and perhaps we should. We've been guilty of assuming that if we don't say that a specific roof prism binocular does NOT have phase coating, our readers will understand that its prisms are phase coated. We will not knowingly present a binocular with potentially inferior performance without alerting you to whatever that shortfall might be. The Monarch 3 binoculars' roof prisms are phase coated as we expect of quality roof prism binoculars today. A binocular's field of view ranks right up with the speed of the focus wheel in making a binocular user-friendly in our opinion. Perhaps some feel we merit a bit of good-natured criticism for harping on these items and it may be that we do. We don't believe we would be serving the best interests of our readers, however, if we remained silent about these things that can make or break a person's enjoyment of a binocular for which resources were likely saved over a period of time prior to purchase. It seems likely that the average individual will realize the impact that the size of the optical sweet spot will have on their experience, consequently we don't say as much about that! Quite simply, the wider the field of view we're able to monitor with our binocular, the less activity escapes us. Birders pick up on this quickly when they want to quickly focus on a bird they've heard, but can't see, or when birds take flight and they're trying to identify them on the wing. The field of view for the 10X42 Monarch 3 is a respectable 299ft at 1,000yds (91.1m at 1,000m). It's either a good, solid average or perhaps a little better than average, depending on your perspective. The field of view for the 8X42 is 330ft at 1,000yds (100.6m at 1,000m). We feel this is average or perhaps just a little on the low side of average. The size of the binocular's useable field of view is something we're interested in with each binocular. It's not good to pay for an extra-wide field of view if half is usable and the other half is all blurry&sol;fuzzy! No matter what binocular is ultimately chosen, we believe that the user's best interests are served by selecting as wide a useable field of view as possible. We found that the Nikon Monarch 3 ATB binoculars had an uncommonly usable field of view, which would make up for the measured field of view being about average. We'll give you more details than we routinely do so you can understand what we encountered and use the information in the choices you make. The field of view was flatter than we expected to see in a binocular at this price point. That means that there was less blurring of the image due to curvature of the lenses as we visually approached the periphery of the field of view. Yes, there was some, but we spent longer working to ensure that we were seeing an actual softening of the resolution of details in the view. When we were done, we concluded that we had found a relatively modest softening of details at around 53&percnt; of the field of view's radius. The resolution of detail was still good at that point, however. At about 67&percnt; of the radius, we felt that the softening presented a significant increase. While using it in the field, we did notice a peripheral ring (we estimated it at perhaps 10&percnt; of the field of view) where the details were fuzzy and unuseable for all practical purposes. This is an impressive performance in view of not using aspherical lenses or extra-low dispersion glass lenses in the Nikon Monarch 3 binocular line as is done with some other lines. We did notice a very small amount of pincushion distortion. This would have been designed into the optics to eliminate the possibility of a "rolling ball effect" which can produce nausea in some individuals. Including very slight pincushioning in designing the optics is normal and what we would typically expect. Of course, as with any manufactured products, there are slight variances between binoculars that are within the tolerances or specifications set by the manufacturer. It's possible that your Monarch 3 might be somewhat different from the one we bought to test and report our findings here. We wouldn't typically expect the variances to be significant, however. The exit pupil specifications provided by Nikon indicate that it's 4.2 for the 10X42 which is as one would calculate it — we mention it simply because some manufacturers provide a measurement which doesn't agree with the calculated exit pupil measurement. One thing that was of interest to us was that we needed to have our eyes carefully lined up with the exit pupils otherwise we noticed glare in our views. It could often be reduced by adjusting the eyecups from our usual fully-extended positions, but we wondered why we were seeing it with the Monarch 3 binoculars. How do Colors Appear with the Monarch 3 Binocular? We were delighted with rich colors we saw with our binocular. When looking at a white sign for example, however, we did notice a slight yellow bias to the view. This was not enough to notice without looking specifically for it and it's unlikely to affect users' enjoyment of their Monarch 3 binocular. We mention it for completeness and for those who tend to be as enthusiastic about their optics as we are about ours. The most likely reason for a minor color bias would seem to relate to the reflective coating for the roof prisms. The silver alloy used for the Monarch 3's prisms is typically a very good reflective material and was for years used on the high-end binoculars then available. It reflects colors across the spectrum, but tends to reflect yellows just a tiny bit more than others — we're tempted to assume this is the basis for a slight color bias. When viewing a plumbing standpipe on a neighbor's roof against a clear, bright sky with our test binocular, there was a very modest amount of chromatic aberration outlining the dark pipe. Not an excessive amount and probably not enough for most people to notice in ordinary use. Again, we mention it for those who to whom it matters and suppose those might include seasoned bird watchers and people who use binoculars in their work, for example. It wasn't enough for us to not recommend the Monarch 3. As mentioned above, the reflective coating used on the prisms in this binocular is a silver alloy. The reflective prism coating (for roof prism design binoculars) are essential elements to enhancing the ability of a binocular to transmit light to our eyes. 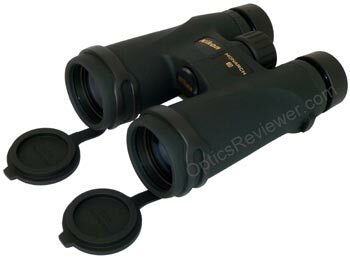 Another factor that enhances the low light performance of this binocular is the fact that the optics are fully multi-coated. When all other things are equal and we have a choice between multi-coated and fully multi-coated optics, we generally go with the fully multi-coated for the specific reason that low light performance is enhanced. We consider the Monarch 3's capability to provide usable images to us in low light settings, such as dusk and pre-dawn&sol;dawn, to be average at its price point. While testing it, we took our Nikon Monarch 3 binocular out at night to see how it would handle light at night. When we looked at a bright parking lot light, we noted four relatively strong spikes extending outward from a light. This may be a factor to consider if to use the binocular for amateur astronomy. Unfortunately, we found that when we were not trying to test for control of stray light we were bothered by glare that affected our ability to see what we were trying to focus on. If you hold a binocular so you can see into the barrels through the objective lenses with light shining into the barrels, you should be able to see what we might call ribs (light baffling elements) and&sol;or spacers lining the barrels. These are designed to reduce reflected light rays of varying lengths inside the binocular. We suspect that the design and amount of the Monarch 3's baffling is allowing the glare to reach our eyes. How Close will the Monarch 3 Focus? While testing for distortion and the usable portion of its field of view, we checked the close focus distance for our Monarch 3. While Nikon specifications indicate that our 10X42 will have a close focus of 9.8ft (3.0m), our test unit was able to get a sharply defined focus at 9.0ft (2.7m). 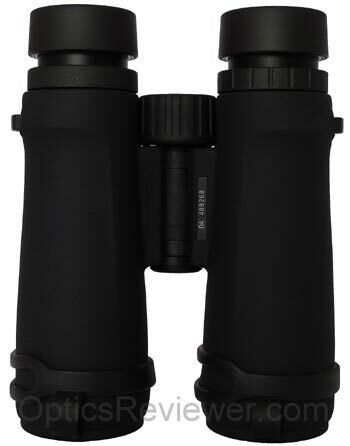 Our recommendation for bird watching is an 8.0ft (2.4m) close focus. Is the extra distance a deal killer? Althought it may not be for some birders, it will be significant for many and we provide the information for those who want to consider it. How Difficult is the Diopter Adjustment to Change? 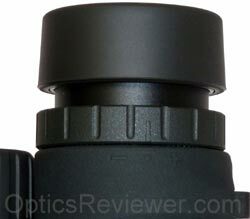 The diopter adjustment is a ring located under the twist-up eyecup on the right barrel. Nikon's designers have wisely provided for it to adjust stiffly — thus preventing most, if not all, unintentional changes to the adjustment. What Comes in the Monarch 3's Box? We're all interested to know what all comes with something when we order it! Although you might think we'd get over it, we're just as interested to see what comes out the box when a new binocular arrives as we ever were! The carrying case that comes with the Monarch 3 is made of a durable-feeling, woven synthetic fabric. It has a soft synthetic lining with a soft padding. The case is held closed with a Velcro fastener. The carrying case does not have a separate neck or shoulder strap. There's also a belt loop stitched on the back of the carrying case. While the durability of the fabric used to make the case is good, we wouldn't characterize it as being particularly strong. We suspect the best use of the belt loop will be to keep the empty carrying case from getting lost. The binocular's neck strap is what we use when carrying the binocular in its case. A 1.5in (3.8cm) wide neck strap is provided with the binocular, too. It seemed to support the weight well and was comfortable. What about a Rain Guard and Lens Covers for the Monarch 3? The rain guard included with the binocular is made of a durable plastic with a flexible bridge between the two ocular covers. It has an open tab on the left to accommodate the neck strap to reduce the chances of it getting lost. It also has an open tab on the right with a split to allow you to take it off the neck strap, should you prefer that. We like having the rain guard on both neck straps as opposed to dangling from the left one, but that's probably just us! We didn't have any problems with the rain guard popping off the eyecups when we weren't watching. This was a point of interest since it was a regular complaint against older Monarchs. The outside surface of the eyecups is of a softer, more rubber-feeling material and it provides a reasonable amount of friction. We think that the combination of "deeper" rain guard caps with the eyecup friction makes the rain guard stay on better with the Monarch 3 than it did with the older generation binoculars. The objective lens covers are made of a softer, more rubber-feeling material. We had no problem with them staying attached to the barrels, but we didn't find them reliable when it came to keeping the lenses covered! (They usually come away from the lenses when taking the binocular out of the carrying case, too.) There is a protrusion on the back side of the covers that fits into the barrel and is designed to stay there by friction. The problem we perceive with this type of cover is that the tolerances must be fairly precise in order for them to function as intended. We took them off and left them in the box, rather than taking a chance on losing them. 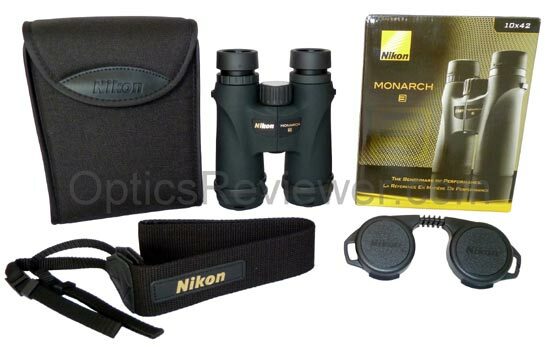 The Nikon Monarch 3 ATB binoculars present a reasonable value. We think they're good for beginning bird watching, general use binoculars, sports, and hunting for example. Does anyone expect full-size binoculars to be perfect in all respects and still be affordably priced? We trust that's not the case. Our favorite online retailer for the lowest prices is Amazon. Here's a link that will take you directly to the Monarch 3 selection available Amazon.com . If you'd like a binocular with a bit better control of strong light so that glare is reduced and if you'd like something that provides a brighter image&sol;view, we suggest giving thoughtful consideration to a binocular in the Monarch 5's category. In fact, we wrote an article comparing the Monarch 3, Monarch 5, and Monarch 7. If you'd like to stay within the Monarch 3's price range, we're willing to bet that you'll love the review comparing the Monarch 3 with Sightron's SII Blue Sky binocular. What does Nikon's Binocular Warranty Cover? Nikon's 25 Year Limited Plus No-fault Warranties are excellent. They cover the binoculars during the time that you would reasonably expect them to be in their prime and functioning smoothly. If yours require a service or repair not covered under the limited warranty, you'll want to slip $10 in with them and you'll be responsible for return shipping and handling. They're covered even if the problem was your own fault.